Your site is written in software code, written by techies and read by computers. This code, called a web page source code, is not normally visible to the viewer, but can be seen on a PC using "Page Source," or on a Mac with the Apple-alt-U command in Safari or in the Safari Develop menu. Source codes contain invisible tags. These invisibles are important because Google, as well as Bing/Yahoo and other search engines, take in mind the background information found in the invisibles when they position the site. The source code has slots for all kinds of tags, like "alt". An alt tag displays an unseen caption that describes an image. All possible tag opportunities should be utilized. Every day, more people are searching the web with smart phones. Be sure that you have style sheets optimized for mobile devices. Use cache control to help the browser temporarily store information on the page. This speeds up repetitive use of logos, headlines and key phrases. Scaled images—ensure that all images are scaled correctly, so that the image dimensions entered in your HTML code correspond to the actual image size and pixels. As much as possible, meet WAI/Section 508 standards, coding for the impaired. WAI stands for Web Accessibility Initiative. Code or format the content on your site as much as possible to meet web development standards, known as W3C. In general, these standards set acceptable scripting formats. There are several layers of standards set by the World Wide Web Consortium. You don't have to meet the strictest, but it is a good idea to meet at least one of them. Maximize keyword recognition with HTAccess. Explaining this could take an entire article, but to make it simple, if you have large amounts of data on your site, you want dynamic pages. Minor changes to dynamic page URLs allow display of huge amounts of data from your database. This means that a single dynamic page can replace untold numbers of static pages, preserving the sanity of your web developer. Your developer can use HTAccess to give dynamic pages keyword-rich URLs. HTAccess is a script that tells your web server (a computer at Network Solutions, GoDaddy or elsewhere, even down the hall) to display a name different from the actual dynamic page name. This is one of the things the search engine sees and uses to position you. These are the basics for making the best of your invisibles. If they were not dealt with when the site was built, do it now. Last note: In addition to invisibles, an important behind-the scenes detail is domain registration. Don't forget to register your domain properly. When you renew domain registration, do it for three years or more. Google likes to know you're going to be around awhile. 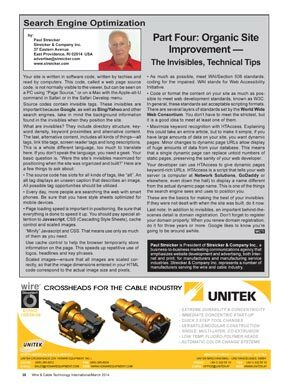 This is the third in a series of articles being published bi-mothly in Wire & Cable Technology. Part one is here. Part two is here. Part three is here. Part five is here.